Blurb: She is his greatest temptation. Elle Beaumont has learned life's lessons the hard way--by foolishly exposing her youthful heart to love, only to have it broken when her true love fled Pilot Island, North Carolina. Now Noah Garrett is back, rekindling dreams she'd given up for lost, and turning her world upside down. Elle's girlish yearning for him has become something more powerful than she'd ever imagined. A man dedicated to science and rational judgment, Noah rejects all notions of romance...until the girl who used to cling to him like a shadow begins haunting his every thought. But even as he struggles to resist Elle's sensuous beauty and the wildfire attraction erupting between them, Noah cannot deny that their passion is as irresistible and endless as the tides of love. About the author: Tracy’s story telling career began when she picked up a copy of LaVyrle Spencer’s Vows on a college beach trip. A journalism degree and a thousand romance novels later, she decided to try her hand at writing a southern version of the perfect love story. With a great deal of luck and more than a bit of perseverance, she sold her first novel to Kensington Publishing. Tracy will be giving away a Kindle to one randomly drawn commenter at the end of the tour. Leave a comment along with your email to be entered to win. Historical Romance would be one of my favorite genres. I love to add great books & series to my wish list. This book sounds interesting, although Historical Romance isn't one of my usual genres. Thanks for sharing it! I love historical romances. These books sound amazing. Can't wait to read them. I put them on my wishlist. What a great goal--to get to 100 countries. Maybe when your son gets a little older, he'll join you on your country-quest!? 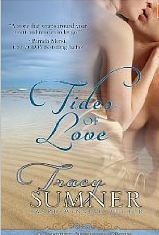 I can't wait to read your Tides books. They look great.